I’m starting to get a little burned out on cooking right now, just a little. If you head over to the Thanksgiving Tutorials section you’ll find lots of new goodies: gluten-free cornbread, stuffed acorn squash, cranberry orange relish (among others). By this time next week I’ll be in Thanksgiving overload–and it’s only October! It is exciting though, so I can’t complain too much, and thankfully folks managed to eat a huge chunk of the stuffings, squash, and relish last night at a potluck I hosted. As a magnet on my fridge says, “good cooks never lack friends.” So true! In other news, it’s been cold and wet over here in southwestern Virginia–I know I’m farther north than I used to be, and at a higher elevation, but I wasn’t expecting it to be in the 40s so soon. The weather report says it’s going to warm up again next week, but I’m not sure if I can believe it. My friends who are thru-hiking the Appalachian Trail reached just north of here and have realized that the weather is downhill, as well as their hike, from now on. Thankfully they’re southbound, so they’re not hiking up into New England’s nasty end-of-autumn-beginning-of-winter-weather. Dorian, as you can see, is enjoying the local fauna. For these cold and blustery autumn days, when I’m not cooking up a Thanksgiving dish or meal for Alternative Thanksgiving, I’ve begun to make a lot of soups. Soup is just so warming–anything that warms my nose back to a regular temperature while I’m eating it gets major points in my book. 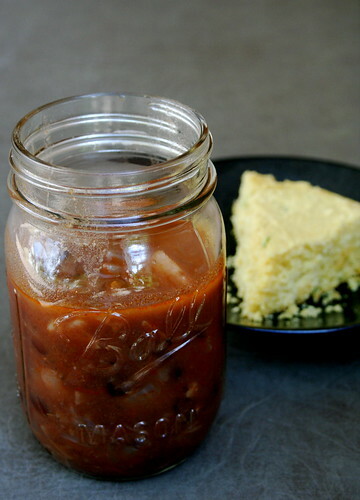 This Southwestern Cabbage Soup is my answer to a clean-out-the-fridge-and-pantry day: half a cabbage, a can of beans, potatoes, onions, a habanero pepper, chipotle chili powder. Corn would have been nice, but I didn’t have any. So my serving of cornbread on the side had to suffice. The soup couldn’t have been easier or more convenient to make and it definitely warmed my spirits while the rain poured. As with any recipe like this, mix and match whatever ingredients you have on hand–the flavor builds with almost any ingredient! Warm the olive oil in a large thick-bottomed pot over medium-high heat. Stir in the salt and potatoes. Cover and cook until they are a bit tender and starting to brown a bit, about 5 minutes. Stir in the onion and cook for another 5-7 minutes, until the onion softens. Add the minced habanero pepper and chili powder and cook for 30 seconds more. Add the vegetable broth, beans, and cabbage and bring the pot to a simmer. Let the soup simmer for 35-40 minutes, serve with cornbread. When I have a cabbage, I always think “check Jes’ blog” because you have so many great cabbage ideas! It’s in the 40s here in Boston too..uck..warming soup is what I need too. 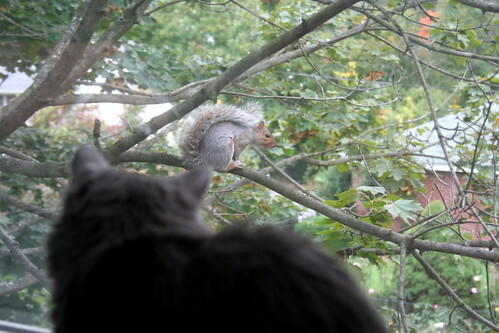 Too bad your squirrel is grouchy..they must be stressed out that winter is coming early! Mine are running around non-stop right now. oh, you wouldn’t have escaped the 40s here in atlanta. we’ve got ‘em too! stubbornly, i haven’t turned on the heat yet. i must say i’d be a little burned out from all that cooking too, Jes. i don’t know why i never thought to combine cabbage with southwestern themed yummies, but i love the idea! it sounds wonderful & looks fastastic! such a tasty way to warm up. while i’m excited it’s not summer anymore, i’m a little sadfaced it’s been so darn cold these past few days. i look forward to some milder fall weather, fo ‘sho. i’m just not quite ready for winter. I’m really excited and giddy as a school girl. That cabbage soup looks great. I’m a mason jar whore haha. I have so many of your recipes bookmarked. I love this one too! That sounds so good! I definitely have to make it some time this week. thanks so much, i was looking for a good recipe using cabbage in soup!!! It warmed up to 62 in NY today, but 40 the other night….